If you run a daycare, a school or are even a homeowner with children, there is a good chance that you have a sandbox. If you don’t have one now, you may be considering to have one installed in the near future. But just having a sandbox is not enough. It needs to be maintained and kept clean. What is the best way to do that? The easiest and most practical solution is to purchase a sandbox cover. While many people simply place a tarp over the sandbox, the reality is that a tarp doesn’t really do the job. Sure, you can tie down the tarp and hope the wind doesn’t blow it off, but it doesn’t do the job completely. If you run a daycare or school, you know as well as anyone that playground equipment needs to be up to par at all times. We want our children to be safe and the parents to be happy. The best way to do that is to maintain a safe, clean and organized playground. The sandbox is a popular destination for many children. They can spend hours in there and it is a great place for them to use their imagination. But sand can also be messy and it has a tendency to get all over the place. We tend to rediscover this each time we spend an afternoon at the beach. Ok, so you need a cover, but which is the best one on the market to purchase? If you are going to purchase a cover, it is best to go with a ‘weighted edge sandbox cover’. 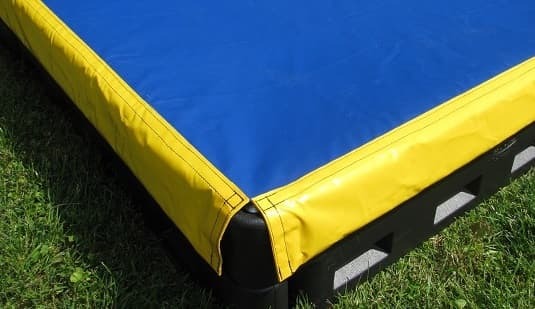 Because the edge of these types of covers are weighted down, you can be assured that the cover places on the sandbox firmly, keeping out unwanted elements and maintaining a secure, clean and safe sandbox. Below are five reasons why you should consider a weighted edge sandbox cover. 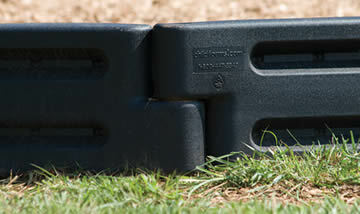 Because the weighted edge sandbox cover is weighted on each side, it fits over the sandbox securely, keeping out water. If you have ever run a daycare or are familiar with maintaining sandboxes, you know as well as anyone that water can ruin a sandbox. Keeping the sand dry is imperative. It’s not that a little water is going to hurt anyone, but it makes for a messy sandbox. Little children and going to jump into the sandbox regardless or if there is water in it and what follows is a big mess. We want to keep those sandboxes nice and dry so the sand doesn’t stick to children’s clothes. Whether you are a teacher or a homeowner, you certainly don’t want to be cleaning up sand in the classroom or in the home. It is also important to create a sandbox environment that is fresh, dry and inviting. Now, there are some sandbox owners that prefer the sand to be a little bit damp. This is a matter of preference. If that is the case, the weighted edge sandbox cover also comes in a ‘mesh’ material. Either way, you will still be getting the weighted edge, which lets it stay on firmly. If you own a sandbox, you know that all types of unwanted elements, including small animals and insects will try to get into the sand. Having a secure, weighted edge sandbox cover does a great job of keep out any unwanted pests and litter. You may be thinking that simply throwing a tarp over it will suffice. But if you have ever used a tarp for anything, you know this isn’t the case. A tarp is a good for a strictly temporary fix, but you want to keep your sandbox clean and free of outside debris for years to come. Besides keeping out trash, the weighted edge sandbox cover helps to keep out insects. Kids will be rolling around in the sandbox and having a grand old time, so it is necessary that the sand is clean, free of debris and dry. So we have determined that the weighted edge sandbox cover is a great way to protect your children from dirty and contaminated sand, but did you know that sandbox covers are required by law in many states? In recent years, several states have taken action to ensure that playgrounds are safe and clean. Many states have taken action and set minimum requirements for institutes that have sandboxes. Most of these minimum requirements include a sandbox cover. You may want to check with your state officials to make sure that your playground is up to date with legal policies. Unfortunately, playgrounds have become a place for individuals to take legal action whether it is legitimate or frivolous. Therefore, it is always best to make sure your playground is safeguarded against legal action. You may also want to consider a certified safety playground inspection as well. I’m sure you’ve been to the beach on a hot summer day at some point in your life. You will recall that sand get quite hot. Having a high quality sandbox cover like the weighted edge one will ensure that your sand will stay nice and cool. Children love the feel of cool, dry sand. A place where they can be comfortable and use their imaginations. During the hot summer months, it is imperative to keep the playground cool. Besides sandbox covers, many day cares, schools and institutes have also opted for playground shade structures. With summers becoming hotter than ever, it is more necessary to keep your playground cool and protect children and staff from UV rays. Click here to find out more about playground shade structures. Let’s face it, besides keeping your sandbox clean, fresh, cool and dry, having a high-quality cover also makes it look professional. More importantly, it makes the rest of your playground, daycare, school and/0r business look professional. If you run a daycare, you are also running a business. When new parents come for their initial visit, you want to make a good impression. You may opt for the inexpensive route and purchase a very inexpensive cover or simply use a tarp, but how is that going to look to parents that want the best for their children? You want your playground to be tidy, organized and in great condition at all times. The weighted edge sandbox cover is not only high-quality (made in the U.S), but it just looks nice and professional. To find out more about the weighted edge sandbox cover, please visit here for more information. We may also want to check out this informative video below which demonstrates how to use this high-quality cover.